At 2 minutes in, we get to view this Encounter with another Being! Wasn’t that delightful and so poetically expressed?! The scientist is a poet is the earth... All interconnected. Whatever you choose to do in that moment, the truth is You are no longer alone. You are in an encounter, a powerful encounter that gets rewired into the neural pathways in your brain and anchored in via a high state of emotional arousal into an unforgettable memory. When you choose transformation from the inside out, especially face to face with one of Nature’s most powerful teachers, the unforgettable memories formed become benefits experienced as increased resilience and coherence and dynamic feelings of Presence, Pleasure, Power and Purpose. This has always been the outcome throughout over 20 years of facilitating live ∞ Ancient Snake Medicine ∞ encounters. Nature has the ancient solutions to our modern dilemmas! Do you feel the Desire of the Divine pulsing within your one wild precious life? Are you ready to have that conversation about how you can entwine in Snakesss? Here's a link for envisioning purposes that will prepare both of us to make empowered decisions when we speak together. 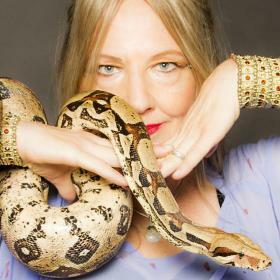 Ps: Watching this video helps me reaffirm why I do the work I do as a 21st century Snake Priestess.